Peel the garlic cloves. To peel garlic cloves easily, soak them in water for about 15 minutes before peeling. Heat 1 tbsp of oil in a small pan. Roast the garlic cloves in low heat for few minutes. The garlic should change into golden brown color gradually. If it browns very quickly, the garlic tastes bitter. The taste of the whole chutney will get ruined. Remove the garlic cloves into a plate and let it cool. Next roast the dry red chillies and tamarind in the same oil. Now you can make a smooth paste of all the above ingredients with required salt. When making the paste add 1 or 2 small tomatoes along. Heat 1 tbsp of oil in a small pan. Splutter the mustard seeds. Add the ground paste. Let it cook till oil separates from the chutney. The tomatoes and the garlic will get cooked. The result is a finger licking chutney. 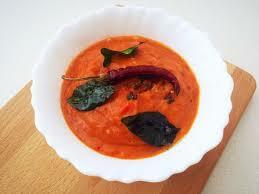 The roasted garlic chutney tastes great with idli, dosa, chappatti, adai, boiled tapioca, parathas etc.